MARPLOT® is a mapping program developed jointly by NOAA and the Environmental Protection Agency (EPA), and it runs on both Windows and Mac computers. Download MARPLOT from the EPA CAMEO® site. With MARPLOT's easy-to-use GIS interface you can add your own objects (symbols, rectangles, circles, polylines, and polygons) to maps, as well as view and edit data associated with those objects. You can choose between several basemaps for the background image, and you can customize your map further with annotations and online Web Mapping Service (WMS) layers. You can also interact with the map in other ways, such as getting population estimates within an area. As part of the CAMEO software suite, MARPLOT can be used with other programs in the suite: you can link map objects to the CAMEOfm database program and easily display ALOHA® threat zones. However, MARPLOT can also be run by itself as a general mapping program. 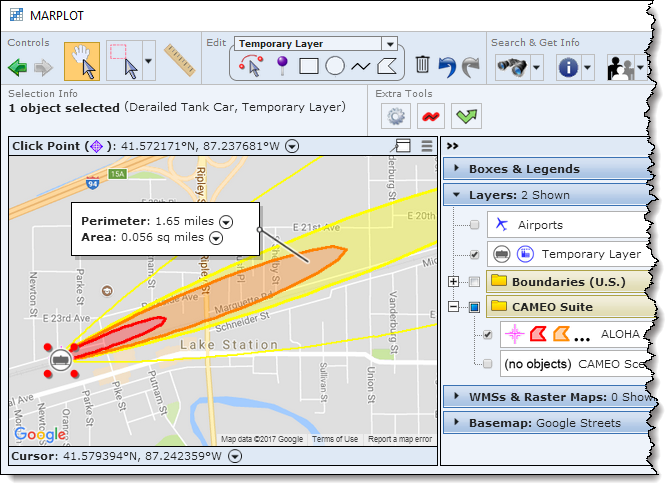 Sample MARPLOT screenshot showing a fictional train derailment with ALOHA threat zone estimates for the chemical release. MARPLOT Fact Sheet [PDF, 667 KB]: Learn more about the key features in the MARPLOT program. Questions: Contact us with questions, comments, or suggestions about MARPLOT.